Unlike Punishment, to use one example of my love for MacIntyre’s novels, one where I raced through the pages and was left begging for more and never wanting it to end, The Only Cafe left me feeling like I was on a hamster wheel, going around and around the wheel reading about the same thing over and over again, never really moving forward. Whereas I normally have a hard time peeling my eyes away from MacIntyre’s stories, this one I was struggling to pick up. I just wasn’t compelled to reach for it. Highly unusual for me! 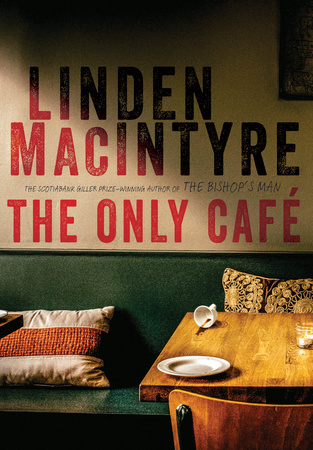 The Only Cafe is: “about an enigmatic man haunted by a troubled past in his native Lebanon and the Canadian-born son who tries to solve the mystery of his father’s life.” (taken from publisher’s synopsis.) This Quill and Quire review sums up some of my thoughts and feelings about this novel, and gives a good sense of how this should have been a more excellent read by MacIntyre, given his own personal journalistic experiences covering one of the many atrocious war-torn moments in Lebanon’s history. So there were parts with Pierre Cormier that were very interesting, however, I didn’t feel his involvement in this Lebanese massacre to ring through clearly with the impact I wished, and it’s also bogged down by this weird side-story about international issues with the mining company Pierre’s now been fired from. Thrown in to the mix in Pierre’s story is a cancer diagnosis, an ex-wife, a new wife and child and time spent hiding away in Cape Breton. (Is he hiding out in Cape Breton because of the Indonesian mining debacle? Or because of his past in Lebanon?) So much added “noise”, not enough development of his traumatic experiences in Lebanon, and his involvement in the 1982 massacre there. There were just so many loose threads all over the place. His son, Cyril, is working “somewhat” (I put that in quotations because it didn’t ring solid for me either) to piece together his father’s past with his disappearance/death, but also current stories about Muslim extremists in Canada – but this too is too loose and weird. Thank you to Penguin Random House Canada for sending the Advanced Reading Copy. Appreciated as always.